The pulp equipment for Jiangxi Yudu Zhengyi Paper Mill 450t/d corrugated paper manufacturing plant production is finished continuously, here this time is the delivery site of Light Impurity Separator, High Density Cleaner, Drum Pulper transmission and feed hopper. Delivery Equipment: Light Impurity Separator, High Density Cleaner, Drum Pulper transmission, feed hopper. Leizhan manufacture high quality and cheapest pulp equipment for paper mill, welcome to consult us for more details: leizhanchina@gmail.com. Zhengzhou Leizhan Technology Paper Machinery Co., LTD., founded in the year 1980, is a professional manufacturer in researching and developing complete sets of waste paper pulp equipment. Our waste paper recycling plants and pulp equipment are highly praised by customers in paper making industries around the world. 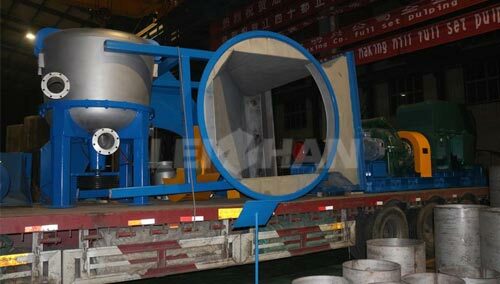 Leizhan paper pulp machine are mainly about pressure screen( M.C. pressure screen, Inflow pressure screen ), Drum Pulper VS D type Hydrapulper, Bale Opener, waste paper Chain Conveyor, Pulp Pump, Vertical Hydrapulper, Light Impurity Separator, Auto-cleaning Vibrating Screen, Reject Separator, refiner equipment, etc. What Are The Advantages Of Mixed Pulp Technology? How To Make Full Use Of White Water? How to deal with the complex wet part of paper making machine? ©2011-2015 Leizhan China. All rights reserved.